In this tutorial you will learn how to implement a simple network protocol using libdill. The source code for individual steps of this tutorial can be found in tutorial/protocol subdirectory. Handles are libdill's equivalent of file descriptors. A socket implementing our protocol will be pointed to by a handle. Therefore, we have to learn how to create custom handle types. Function hmake() does the trick. You pass it a virtual function table and it returns a handle. When the standard function like hclose() is called on the handle libdill will forward the call to the corresponding virtual function, in this particular case to quux_hclose(). The interesting part is that the first argument to the virtual function is no longer the handle but rather pointer to the virtual function table. And given that virtual function table is a member of struct quux it's easy to convert it to the pointer to the quux object itself. At the moment we can just return ENOTSUP from the other two virtual functions. Consider a UDP socket. It is actually multiple things. It's a handle and as such it exposes functions like hclose(). It's a message socket and as such it exposes functions like msend() and mrecv(). It's also a UDP socket per se and as such it exposes functions like udp_send() or udp_recv(). libdill provides an extremely generic mechanism to address this multi-faceted nature of handles. In fact, the mechanism is so generic that it's almost silly. There's a hquery() function which takes ID as an argument and returns a void pointer. No assumptions are made about the nature of the ID or nature of the returned pointer. Everything is completely opaque. To see how that can be useful let's implement a new quux function. First, we have to define an ID for quux object type. Now, this may be a bit confusing, but the ID is actually a void pointer. The advantage of using a pointer as an ID is that if it was an integer you would have to worry about ID collisions, especially if you defined IDs in different libraries that were then linked together. With pointers there's no such problem. You can take a pointer to a global variable and it is guaranteed to be unique as two pieces of data can't live at the same memory location. To understand what this is good for think of it from user's perspective: You call hquery() function and pass it a handle and the ID of quux handle type. The function will fail with ENOTSUP if the handle is not a quux handle. It will return pointer to quux structure if it is. You can use the returned pointer to perform useful work on the object. But wait! Doesn't that break encapsulation? Anyone can call hquery() function, get the pointer to raw quux object and mess with it in unforeseen ways. But no. Note that quux_type is defined as static. The ID is not available anywhere except in the file that implements quux handle. No external code will be able to get the raw object pointer. The encapsulation works as expected after all. Let's turn the quux handle that we have implemented into quux network socket now. We won't implement the entire network stack from scratch. The user will layer the quux socket on top of an existing bytestream protocol, such as TCP. The layering will be done via quux_attach() and quux_detach() functions. Note gow hown function is used to take ownership of the underlying socket. hown will give it a new handle number, thus making the old handle number owned by the caller unusable. libdill recognizes two kinds of network sockets: bytestream sockets and messages sockets. The main difference between the two is that the latter preserves the message boundaries while the former does not. Let's say quux will be a message-based protocol. As such, it should expose functions like msend and mrecv to the user. Add a similar stub implementation for quux_mrecvl() function and proceed to the next step. Now that we've spent previous four steps doing boring scaffolding work we can finally do some fun protocol stuff. Function msend will forward the call to our quux_msendl() stub function which, at the moment, does nothing but returns ENOTSUP error. To implement it we have to decide how the quux network protocol will actually look like. Given that size field is a single byte messages can be at most 255 bytes long. That may be a problem in the real world but this is just a tutorial so let's ignore it and move on. Note that payload data is passed to the quux_msendl() function in form of two pointers to a structure called iolist. 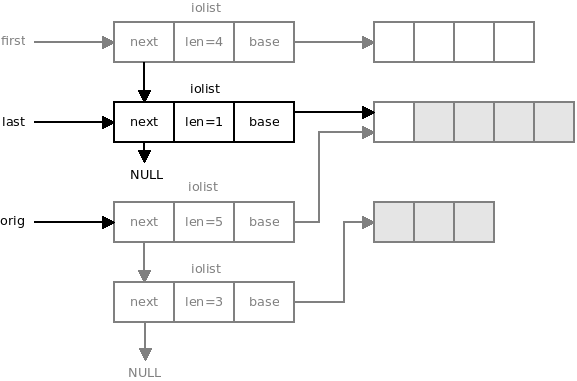 Iolists are libdill's alternative to POSIX iovecs. Where iovecs are arrays of buffers (so called scatter/gather arrays) iolists are linked lists of buffers. Very much like iovec, iolist has iol_base pointer pointing to the data and iol_len field containing the size of the data. Unlike iovec though it has also iol_next field which points to the next buffer in the list. iol_next of the last item in the list is set to NULL. Don't forget that there's an extra field in iolist, one called iol_rsvd, which should be always set to zero. Given that we decided to prefix quux messages with message size we have to compute the message size first. We can do so by iterating over the iolist and summing all the buffer sizes. If size is greater than 254 (we'll use number 255 for a special purpose later on) it's an error. To indicate success return zero from the function. Then compile and test. Great. Now we know that the message is sz bytes long. We are going to read those bytes into user's buffers. But let's take care of one special case first. We are facing the same performance problem here as we did in the send function. Calling brecv() multiple times means extra network stack traversals and thus decreased performance. And we can apply a similar solution. We can modify the iolist in such a way that it can be simply forwarded to the underlying socket. The main problem in this case is that the size of the message may not match the size of the buffer supplied by the user. If message is larger than the buffer we will simply return an error. However, if message is smaller than the buffer there's a problem. Bytestream's brecvl() function has no size argument. It just receives data until the buffer is completely full. Therefore, we will have to shrink the buffer to match the message size. In iolist-based functions the list is supposed to be unchanged when the function returns. However, it can be temporarily modified while the function is in progress. Therefore, iolists are not guaranteed to be thread- or coroutine-safe. We are modifying the iolist here, which is all right, but we have to make sure to revert all our changes before the function returns. Note the orig pointer in the above diagram. It won't be passed to the underlying socket. Instead, it will be used to restore the original iolist after sending is done. Consider the following scenario: User wants to receive a message. The message is 200 bytes long. However, after reading 100 bytes, receive function times out. That puts you, as the protocol implementor, into an unconfortable position. There's no way to push the 100 bytes that were already received back to the underlying socket. libdill sockets provide no API for that, but even in principle, it would mean that the underlying socket would need an unlimited buffer in case the user wanted to push back one terrabyte of data. libdill solves this problem by not trying too hard to recover from errors, even from seemingly recoverable ones like ETIMEOUT. When building on top of a bytestream protocol -- which in unrecoverable by definition -- you thus have to track failures and once error happens return an error for any subsequent attampts to receive a message. And same reasoning and same solution applies to outbound messages. Note that this does not apply when you are building on top of a message socket. Message sockets may be recoverable. Consider UDP. If receiving one packet fails you can still receive the next packet. Let's say we want to support mutliple versions of quux protocol. When a quux connection is established peers will exchange their version numbers and if those don't match, protocol initialization will fail. In fact, we don't even need proper handshake. Each peer can simply send its version number and wait for version number from the other party. We'll do this work in quux_attach() function. Note how failure of initial handshake not only prevents initialization of quux socket, it also closes the underlying socket. This is necessary because otherwise the underlying sockets will be left in undefined state, with just half of quux handshake being done. Modify the test program accordingly (add deadlines), compile and test. Imagine that user wants to close the quux protocol and start a new protocol, say HTTP, on top of the same underlying TCP connection. For that to work both peers would have to make sure that they've received all quux-related data before proceeding. If they had left any unconsumed data in TCP buffers, the subsequent HTTP protocol would read it and get confused by it. To achieve that the peers will send a single termination byte (255) each to another to mark the end of the stream of quux messages. After doing so they will read any receive and drop all quux messages from the peer until they receive the 255 byte. At that point all the quux data are cleaned up, both peers have consistent view of the world and HTTP protocol can be safely initiated. quux_done function will start the terminal handshake. However, it is not supposed to wait till it is finished. The semantics of the done function are "user is not going to send any more data". You can think of it as of EOF marker of a kind. At this point we can modify quux_detach() function so that it properly cleans up any leftover protocol data. Note how the socket, including the underlying socket, is closed when the function fails. Adjust the test, compile and run. You are done with the tutorial. Have fun writing your own network protocols!